Hopefully, all the readers of these gadget blogs do more than just play on their computers all day. I want to see you guys exercising, for crying out loud! Of course, we all know how necessary exercise is, and how we need to do a lot of repetitive movements. I don’t know about you, but I’m really bad about counting them. It’s pretty easy to lose count while you’re like watching TV or something. Fortunately, these new Talking Dumbells from Everlast are like a digital personal trainer, counting aloud as you move your arm. I wonder what voice they chose for it. Not only do these things talk, but they have built-in computer monitors for the counting of reps as well as calories burned. It also keeps track of the total workout time. So now you will have a machine telling you what to do. I suppose that is a good thing if you want to lose the weight. 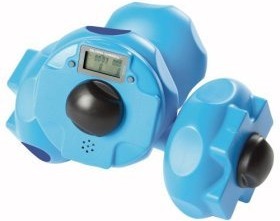 In addition to these features, the dumbbells are adjustable. By adding a little bit of water, you can have weights that are up to four pounds heavy. If you like them, feel free to go on the Smarthome website and purchase it for a price of only $18.99.